As we established previously, quality New York-style pizza is available in Boston, but it's hardly ubiquitous. 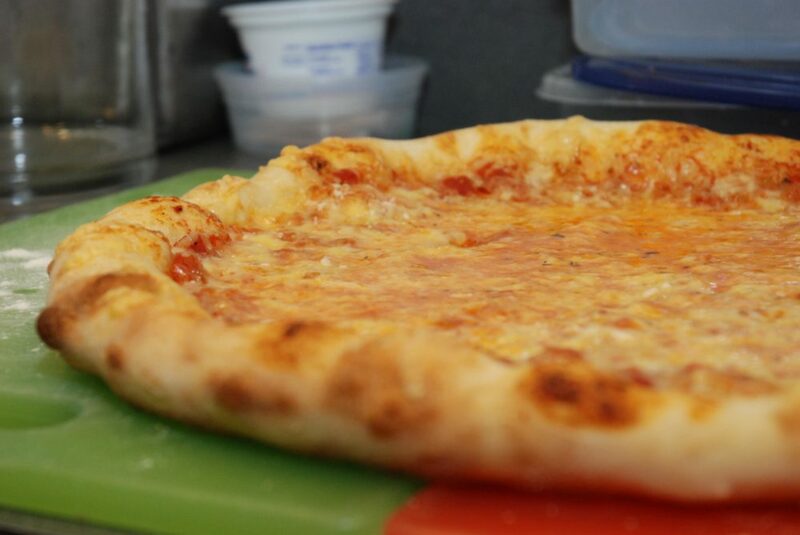 For those of us who don't live within delivery distance of a good place, I've been developing a recipe to achieve authentic, NY-style pizza at home. My first draft was OK, but I asked listeners to recommend a pizza place where I might go and learn some tricks. By far, the biggest vote-getter was Same Old Place, 662 Center St., Jamaica Plain. Owner Fred Ciampa and his son Eric were kind enough to show me some (not all) of their secrets. Based on those findings, I now present my final recipe, which I think is pretty darn good. Before we get there, some notes on the deviations from the first draft. At Same Old Place, they opt for the slow, cool rise, rather than a short, warm rise. After trying that, I found letting my dough rise overnight in the refrigerator (or two or three nights) gets you a more yeasty, almost sourdough-type flavor (very tasty) and a much more satisfying texture. Also, you may note that I upped my flour and water quantities a bit. Why? This recipe is designed to get you two pizzas of the maximum size that can be baked in a home oven; I think my prior recipe resulted in pizzas that were just a touch too thin. Same Old Place pizza is thin, but not quite paper thin. I think these measurements get you exactly the right thickness with two 14-inch pizzas. They use equal parts canned tomato sauce and canned crushed tomatos at Same Old Place. I think this gets you a great combination of textures. They won't reveal their secret seasonings, so we just have to muddle through. Canned tomato products vary wildly in quality; try to get the best you can, but you can always add a little sugar if they don't taste sweet enough. At Same Old Place, they bake between 500-550 degrees, which is much lower than the legendary 1,000-degree temps I've heard about at other pizza joints. So I'm no longer contemplating filing my oven door lock off so that I can bake on the self-cleaning cycle. I have found that if you're patient and let the pizza cook at 550 for seven to eight minutes, the bottom browns, the cheese browns, and everybody's happy. Dissolve sugar in 1/4 cup water. Add yeast and let bloom for 15 minutes. Pour in remaining water, salt and a glug of olive oil. Mix in a stand-mixer with a bread hook. Incorporate flour little by little, then knead on high speed for about 15 minutes. The finished dough should be smooth, a little sticky, and you should be able to stretch it out thin enough to see light through it without it tearing. Split into two even portions, and roll into balls. Let rise, covered, in the refrigerator overnight (2 or 3 nights works, too). Combine the two tomato products, and season to taste with the various spices. Only add sugar if the tomatoes need it. About an hour before you bake, place rack and pizza stone on the second highest position and pre-heat oven to maximum temperature. About 10 minutes before the pizza goes in the oven, turn the broiler on maximum. Remove dough balls from the refrigerator and let warm for about an hour. Place the first ball on a floured surface, and then flour the top. Lay your pizza peel on top of the dough and press down--putting your weight into it--until you have a round pancake about eight inches wide. Toss in the air until it's about 14-inches wide. Spread a thin layer of cornmeal on your pizza peel and lay out the dough on top. Apply thin layer of sauce (the back of a ladle is the best way to get it thin and even). This recipe likely gives you a little more sauce than you'll actually need to sauce both pizzas. Apply half the cheese. Turn the broiler off, reset oven to maximum temperature. Shake the peel to release the pizza, and then deposit it on the stone. Bake 7-8 minutes, or until the bottom is brown. The crust will soften as it cools and absorbs steam from the other ingredients, so it should feel a little hard and over-baked when you pull it out. Let cool at least 10 minutes. Cut into 6 slices. Repeat with second dough ball.